The Morning Call, April 10, 1918. Here is my hottest culinary take: Cottage cheese is delicious. Yes, it’s a neglected staple of a salad bar last redesigned sometime during the first Bush administration, something your grandma ate with cantaloupe. Richard Nixon loved it. It’s a relic of decades-old diet culture, and its datedness is best exemplified by this 1986 commercial on behalf of the stuff by America’s dairy farmers, narrated by Vincent Price. None of that is the fault of cottage cheese, which is a delicious treat in its whole-fat form, with that weird squeaky dairy curd mouth feel that’s such a delight. And now, as the yogurt boom levels off, the New York Times reports it may be ripe for a revival. Finally—justice for cottage cheese! Did you know that during the mid 1970s—“the golden era of cottage cheese”—there was more than a billion pounds of the stuff being produced a year? This was before the rise of yogurt which, as recently as 1962, Dannon had still been pleading with Americans to try, just once, please. 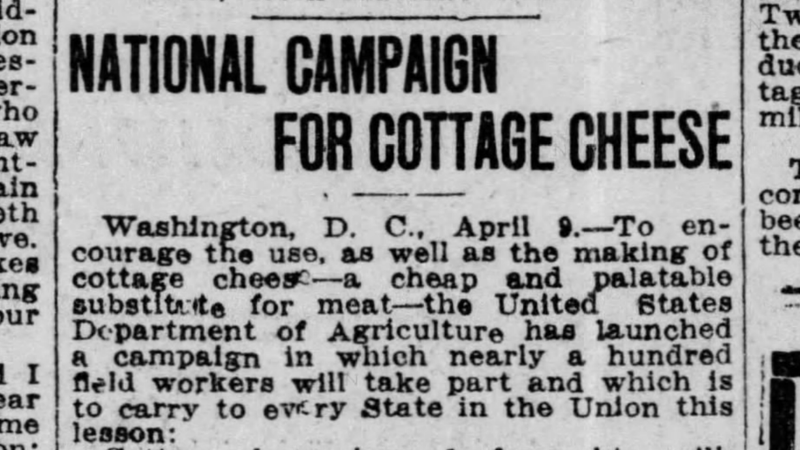 But apparently, part of what happened to cottage cheese in the first place—at least according to Dave Potter, president of Dairy Connection—was mass production leading to inferior product. “Really good cottage cheese is a hard product to make that doesn’t take well to automation.” Hence it would take especially well to the fancy small-batch artisanal hippie food treatment. And honestly? I would at least try a cottage cheese ice cream bar. For science.